Taking place at the same time and in the same city as the Richemont-led SIHH fair, LMVH officially opened their Geneva Days boat on January 14, 2018—docked on the famous Geneva Lake in Switzerland. Displayed on that boat are the 2018 novelties from Zenith, Hublot, and TAG Heuer—all part of LVMH watch division under the direction of Jean-Claude Biver. Today we take a look at some of the new 2018 TAG Heuer watches and unsurprisingly, there’s a mixed bag of mechanical timepieces, ladies’ watches, and smartwatches in the lineup. In 2016, TAG Heuer revamped their Link watch collection, a model that has been around since 1987. Named after the design of the bracelet with S-shaped links, for 2018, TAG Heuer enhances the collection with new Link Chronograph watches. Sized at a reasonable 41mm, the Link Chronograph is currently only available in stainless steel. However, there are two dial colors to choose from—black or blue sunray. A closer look at the new Link Chronograph reveals that the dial layout is different from older generations. Rather than the 6, 9, and 12 o’clock layout of the subdials of preceding models running on Caliber 16, the new Link Chronograph has the 3-6-9 layout thanks to the automatic Caliber 17 movement driving the watch. In addition to the chronograph functionality, there’s also a discreet date window positioned between 4 and 5 o’clock. TAG Heuer has been one of the few Swiss watch brands that have fully embraced the smartwatch movement. And we see the commitment enforced yet again this year with the new TAG Heuer Connected Modular 41. This year’s release is smaller than last year’s Connected Modular 45. 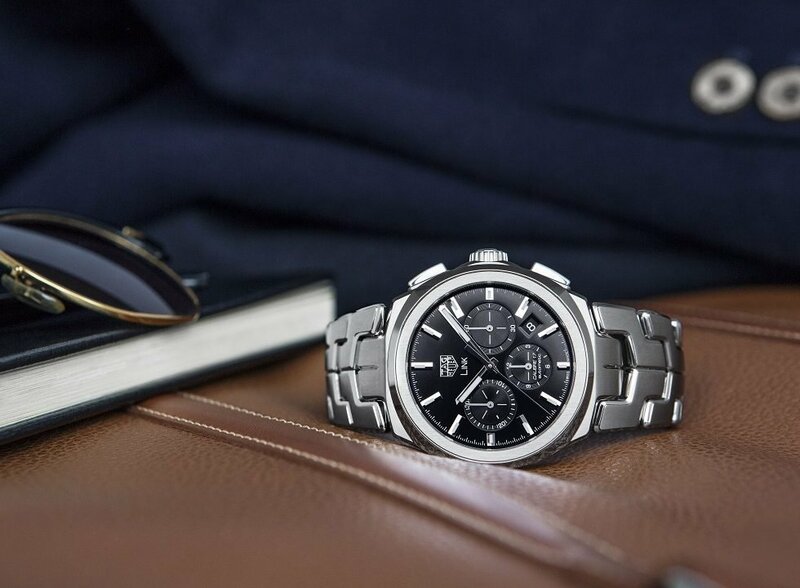 The new TAG Heuer Connected Modular now sports a 41mm case, along with some improvements over the previous TAG smartwatch. Also developed in collaboration with Google and Intel, the new Connected Modular 41 boasts improved screen resolution, screen brightness, storage space, and RAM memory. 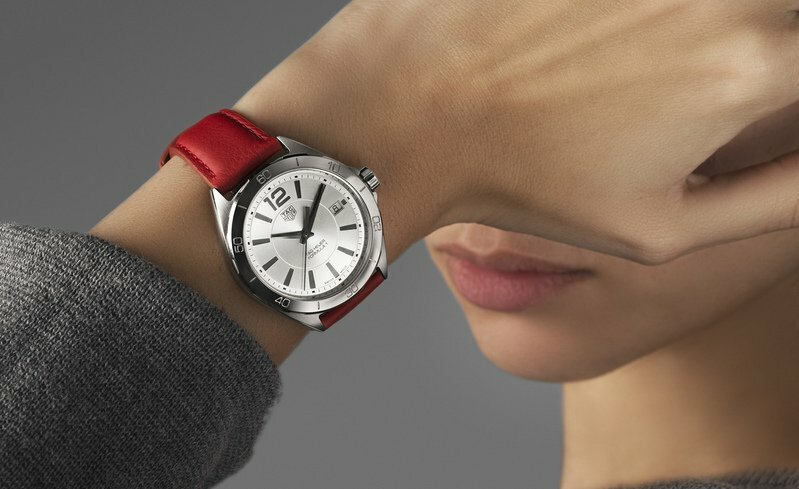 There are seven standard Connected Modular 41 models to choose from, in addition to nine straps colors and the possibility to customize lugs. 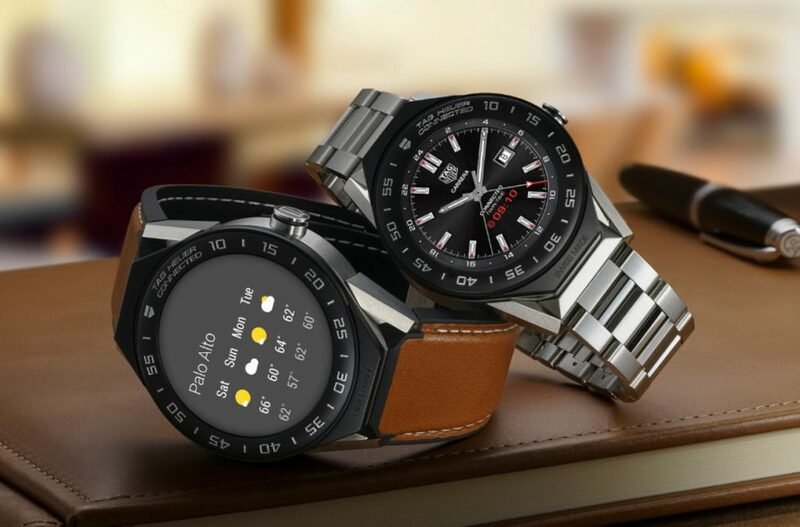 The TAG Heuer smartwatch runs on Android Wear, is compatible with Android 4.4 phones and iOS 9 (or later versions), and is water resistant to 50 meters. Similar to the Connected Modular 45, the latest Connected Modular 41 can eventually be replaced with a Calibre 5 three-hand mechanical module. For the ladies, TAG Heuer has completely redesigned the Formula 1 Lady watch with a new shape, new materials, new dials, and new straps. In fact, for fabulous versatility, the new Formula 1 Lady comes equipped an easy-to-use interchangeable strap system. With a choice of colorful leather straps or a sporty metal bracelet, wearers can easily change the overall look of the watch in a couple of clicks. Available in 32mm or 35mm case sizes, the new TAG Heuer Formula 1 Lady watches are offered in stainless steel, stainless steel with diamonds, or steel with black PVD coating. Do you like the new 2018 TAG Heuer releases? Tell us what you think in our comment section below.